From my point of view, it’s been a good year for new story collections. Now, admittedly, I’ve only read three, but all have been superb. First, there was Mothers by Chris Power, then, more recently, Lucy Wood’s The Sing of the Shore. My third collection is the latest Lithuanian title from Noir Press, and the English-language debut by Ukrainian-Lithuanian writer Jaroslavas Melnikas. Though my life is no longer my own, I feel I’m doing something important here. Everything that happens is important. And to be honest, it’s none of my business what it’s all about. I can sense the importance of it. Something inside me has lit up. The narrator has left his wife and daughter to go on his strange odyssey, and the story examines what it is to step away from one’s existing life. In the case of this character, he has effectively moved into a parallel world – but there are consequences for both him and those left behind, which he will have to confront eventually. Ordinary life, which was easy to understand with its decent laws, seemed suddenly banal. I’m not saying it was entirely comfortable, in that poorly-lit auditorium, standing next to the little scarecrow who kept pulling on her already too-long nose. It was far from comfortable. Everything was opaque, strange, and my nerves were as tense as a string. I no longer understood who I was or what, to be honest, I was doing there. I must admit I’m uncomfortable with the characterisation of the scarecrow in this story: both she and Volodia clearly have deep holes in their lives, but it feels as though she’s only really there to help him heal. Even so, ‘It Never Ends’ left me with the dizzying feeling of having my imagination cast into new shapes. Although many of Melnikas’ stories touch on the fantastical, ‘Would You Forgive Me?’ applies his typical approach to a more down-to-earth situation. The narrator of this piece shoots a man who climbs through his bedroom window one night, and the intruder dies. The protagonist’s wife, Liuba, immediately brands her husband a murderer; the story is his attempt to come to terms with what has happened: “What kind of person was I? What was I supposed to have done then?” Melnikas traces how, over time, the event changes meaning for Liuba and the narrator. The most interesting thing was that we never spoke about the topic again, and nothing changed, nothing at all; we even had quarrels about trifles, like before. Only, occasionally, I would remember that if we trusted that damn Book of Fates, time was ticking… It was a nightmare; you knew the hour of your death exactly and couldn’t do anything about it. I thoroughly enjoyed reading The Last Day; its combination of reflection and light unreality was right up my street. If that’s also your kind of thing, take a look at this book. 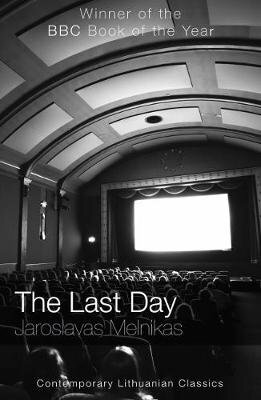 The Last Day (2004) by Jaroslavas Melnikas, tr. Marija Marcinkute (2018), Noir Press, 175 pages, paperback (source: review copy).